It’s time. The United States Open, the greatest tournament of the year, the one that is hardest to win, will be played this weekend on the hardest golf course in America — Oakmont Golf Course, in Pittsburgh, Pennsylvania. I went to Oakmont six years ago to see the U.S. Women’s Open, won by Paula Creamer. All I can say, is, this course is scary. Just walking around it and comparing it to any of the tracks I play or have been on — this course is different. It has size, it has intensity. Either you hit a good shot or you pay a price, and there isn’t a lot of room for hitting good shots. Third fairway (right) and Church Pews. The rake in the bunker indicates scale. You can read my brief hole-by-hole course description here. 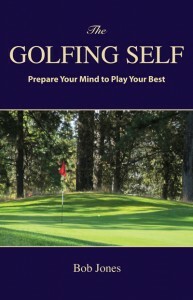 Two things a player must do to have a chance to win: put the ball in the fairway off tee, and keep the ball below the hole on the putting green. In 2007, Angel Cabrerra won with a score of five over par, so don’t expect any low scores this week. 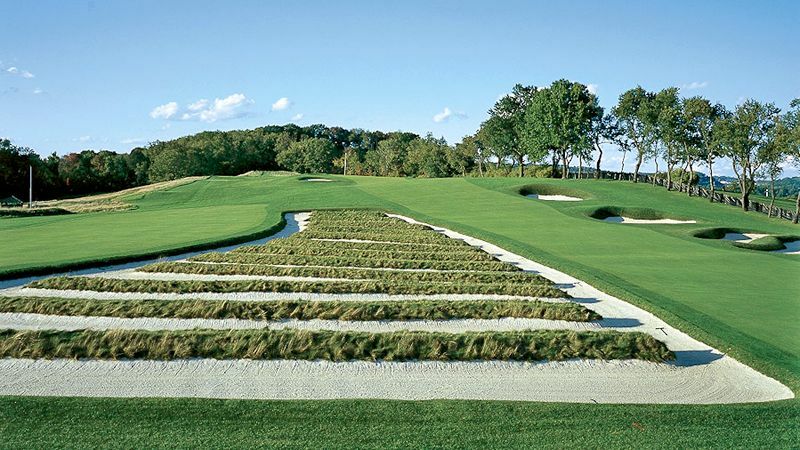 Oakmont means bunkers. I counted 174 in the aerial photo. That’s quite enough. The Church Pews count as one, by the way. 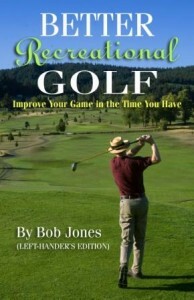 Hopefully, hitting the ball to avoid bunkers would put the ball in the right place for your next shot. In many cases, avoiding the bunkers is enough, and you will worry about your next shot when you get there. From most of the fairway bunkers, a shot onto the green is not possible. Because of the layout of many greens, there is only a small landing area for approaches that will leave the ball on the green, no matter where the pin is. For example, on #3, there is a narrow spot behind a false front, and in front of a slope that will send the ball off the green down to a collect area behind the green, that has to be hit without leaving the player with a touchy up and down. Playing to the back of the 18th green can find your putt running all the way to the front of the green if you aren’t thinking. As for the famous Oakmont rough: When I was there in 2010, I bent down and ran my fingers through it. No problem. I wasn’t that thick, either. I asked one of the marshals, a club member, about it. He said, the catch is the blades of grass are thick. You can run your fingers though it easily enough, but a golf club coming through it high speed gets grabbed and brought to a screeching halt. I’m sure the rough will be thicker for the men than it was for the ladies in 2010. 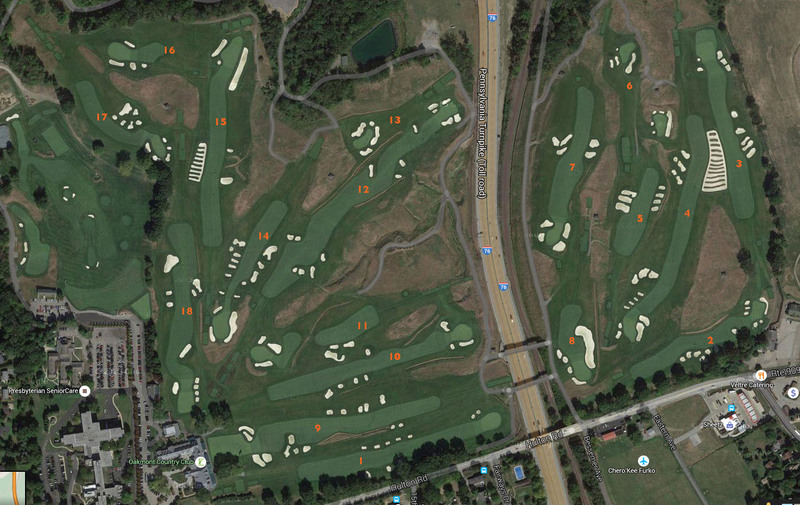 The tan thread-like markings you see on the aerial view of the course are drainage ditches. The play as water hazards. You would rather be in a bunker than one of those. One ditch that will come directly into play runs along the leftist of the ninth fairway as players are hitting into a blind fairway. We could write a book about the greens. They are very fast, but true. In most cases, keeping the ball below the hole is a must because putts coming from above will be hard to stop close to the cup. Contours on some greens might find a player starting a putt away from the hole so th green can turn to back around. Augusta on steroids. Who will win? Normally I like to pick Phil Mickelson, a sentimental favorite, but he has no chance here. Jim Furyk, a straight shooter, he missed the title by just a few shots in 2007, but he’s coming off rehab, so count him out. Among the guys who have the stuff to win a U.S. Open, Matt Kuchar, Zach Johnson, and Rickie Fowler are all driving accurately this year. Jordan Spieth has a two-way miss off the tee that would be disastrous at Oakmont if he doesn’t fix it. Kuchar is pretty high in Strokes Gained/Putting, too. Spieth and Jason Day are right at the top in that category, so if they can contain their tee shots, they should be in it. [Tuesday] Oops, I forgot to say who’s going to win: Brooks Koepka. Last year, Chambers Bay had guys playing pinball, and lots of times the course’s quirks separated the players as much as their skill did. At Oakmont, no good shot is penalized, and no bad shot is rewarded. You do it, or you don’t. That’s how a U.S. Open should be, and that’s why Oakmont is its best venue. Enjoy this one. U.S. Open official web site. Greatest tournament of the year? 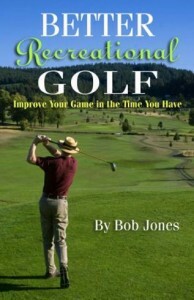 Hardly – Masters and The Open certainly better. Hardest? Probably. That’s what makes horse races.